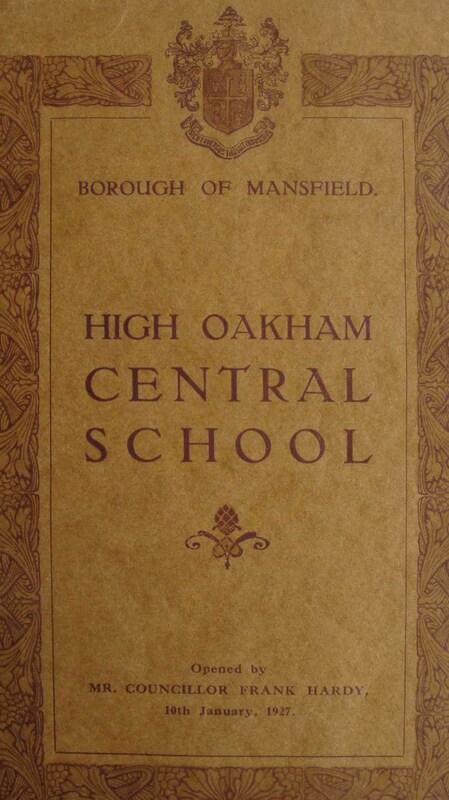 HIGH OAKH.M CENTRAL SCHOOL, MANSFIELD. Once more we send you our warmest greetings and best wishes for your welfare and happiness. It has been a sheer delight to receive letters from so many of your fellow High Oakhamites in all parts of the world where H. M. Forces are to be found and to realise the fine spirit with which you are all imbued. We can tell you now, although we did not tell you very often when you were at school, you’re a grand lot of fellows. Truly the school motto ‘plus est en vous’ could not have been handed over to finer Boy’s by whom the fulfillment of its meaning was more assured. Each one of you is in his own way, we are sure, exemplifying its significance. To a few has been given the opportunity of showing it in a conspicuous way. Thus our congratulations’ go to S.S.M. Graham Rose, M.M. What a splendid commando he has shown himself to be. The account of his exploits is a thrilling document. Also our congratulations to F/Sgt. George Roberts, whose exploits won for him the D.F.M. Concerning members of the Staff, Mr. Barke and Mr. Copley have now obtained commissions. Recently a letter was received from Mr. Barke who is now with the R.AF. in India. Upwards of one hundred Old Boys on leave have visited the school so far this year. We have been delighted to see each of them and when the opportunity permits we hope to welcome still more of you. It has been especially pleasing to renew acquaintance with High Qakhamites from Overseas – India, Canada, S.Africa, W.Africa, Madagascar, etc. You will be sorry to hear that our school ship was torpedoed but we are thankful that Captain Riggs and nearly all his crew and passengers were rescued after taking to the boats. The thrilling rescue by the aid of a Liberator was graphically described in all the daily papers. Captain Higgs’ own account which was sent to the school held the boys spell-bound. Nothing daunted, our gallant captain has now been given command of another ship and will no doubt soon be off again and we hope will safely return with a bumper cargo to help to fill the nation’s larder. A few days ago a Captain from an American Base Hospital came to school and gave a fascinating talk to the boys on Independence Day and its significance. For the occasion we hoisted an American Flag and knowing the Americans do things in a big way as usual we at High Oakham did things in an even bigger way and the flag we procured was 12 feet long. You will no doubt already have pocketed the postal order for 2/6d enclosed herewith. The choir and Mr. Smith have again been at work. We were fortunate to obtain the Granada (previously known as The Plaza) and a concert was given on May 9th. The other artists were Eva Turner, the Covent Garden Soprano and Eileen Joyce, the world famous Australian pianist. Over £100 profit was made! The summer holidays are on us. The term and E.M.E.U. examinations are over and pupils are breathing more freely but the Oxford School Certificate Examination is still in progress. From the school gardens supplies of potatoes, peas, beans, turnips, rhubarb, lettuce and. radishes seem to be coming in an almost endless procession whilst parties of boys are on farms singling, planting cabbages and picking new potatoes. As no doubt you will have heard Mansfield’s ‘Wings for Victory’ Week has recently been held. The Town’ s target was £500,000 but over £620,000 was subscribed. The schools were set a target of £20,000 but this was smashed to smithereens and £3l,400 was raised. High Oakham School was given a target of £650 but nearly £1,300 was provided to help to speed on the Victory which thanks be to you all is rapidly shaping itself. Once more good luck to you. THE HEADMASTER, THE STAFF and THE BOYS. 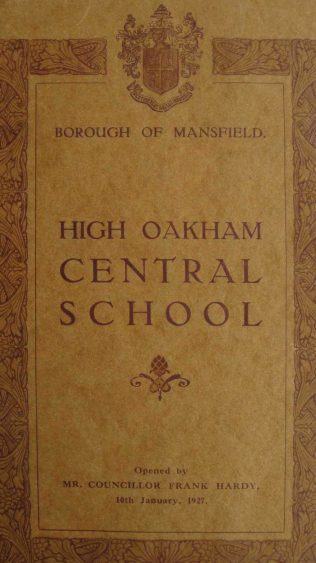 I only went to High Oakham for just over 1 term in about 1957. It was a very strict school with very high standards, even the school meals were good and I was glad I went there even though just for the one term and a few weeks after Christmas before I moved to Norfolk and that was a culture shock, what did I know about gardening and farming! I remember Miss Wardell, Reek and Mr Gamble. At the end of the day we had 2 MDTC buses to take us home, my bus went towards Rainworth, another turned off to towards Crown Farm just under the rail bridge for Mansfield Central, so we had a race through town and Mr Gamble always sat in the back seat upstairs, I recall him saying it was seat, you were obliged to move!! Fond memories. Pauline, Mr William Bertam White was the Headmaster, certainly up to 1949, also the letter was written Mr. William Bertram White.